Cherry Mobile again is getting ahead of the game, releasing the Cherry Mobile W900, and LTE capable device which is first release for local brands in Philippines. 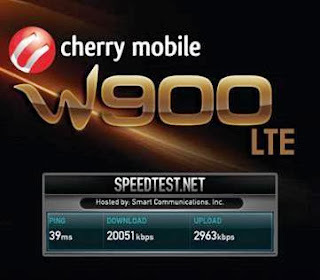 To prove the that Cherry Mobile W900 is really LTE capable, Cherry Mobile has tested the phone on LTE network, and behold, the speed test (conducted on speedtest.net) resulted to more than 20mbps download speed, and 2mbps upload speed. 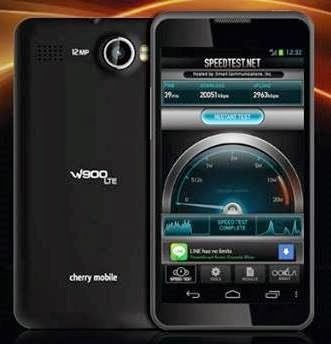 Now back to Cherry Mobile W900, despite the LTE feature, it has some downside there, the battery for example would only be 1700mAh or 1800mAh according to sources. Running on dual core processor, and Jelly Bean 4.2, 4.3 inch HD display on a one-glass-solution, 1GB of RAM, 12MP main camera. Such offering for the cost of Php11,499.00 (SRP). * More specs to add soon. In case you miss it, Cherry Mobile W900 is price at Php11,499 SRP | Availability is yet to be announced.